I’ve already discussed which vodkas are paleo friendly, so I might as well get into wine which is probably a more popular drink choice by many. The good news is that of all the choices for alcohol, wine is probably the best option for paleo people. The type of wine is something that should be taken into consideration though. I’m not about to break down every brand of wine, because there are thousands of them so I apologize if I didn’t bring up a specific 2 buck chuck or Coppola wine. Those are also the only 2 I know off the top of my head. Short answer is…no. If you take the primal lifestyle 100% based on caveman life, then you’ll have a hard time finding evidence of Grok drinking a glass of Pinot Grigio. That isn’t to say that our paleolithic ancestors never consumed alcohol though. Natural fermentation can occur in fruit, juices, and other things that our ancestors consumed. They just weren’t in the high concentrations as we get today from our shots of Grey Goose, but it was ingested, and our bodies were/are able to break down the alcohol. This is one of those vices in the paleo diet where you have to make a personal decision on whether or not you want to boot this from your life or not. Drinking specific types of alcohol in moderation can be fine depending on your own personal wants and needs. I will have a glass or 2 of wine a couple times a week. Beer I’ve taken from my diet. Vodka soda has made its way into my networking drinks so I don’t look like a weirdo ordering an iced tea at a bar. Is Wine OK on the Paleo Diet? That’s going to be a soft yes. As alcohol is not totally paleo because of the processed nature of it and the damage it can cause, there are actually some benefits to drinking wine that could outweigh the reasons not to drink it. I’ll get more into the benefits of drinking wine at the bottom of the article. Wine is probably one of the first, if not the first, alcoholic drinks ever consumed by man. There is evidence to show that wine was made well over 5,000 years ago. You’ll want to look for the driest reds available. 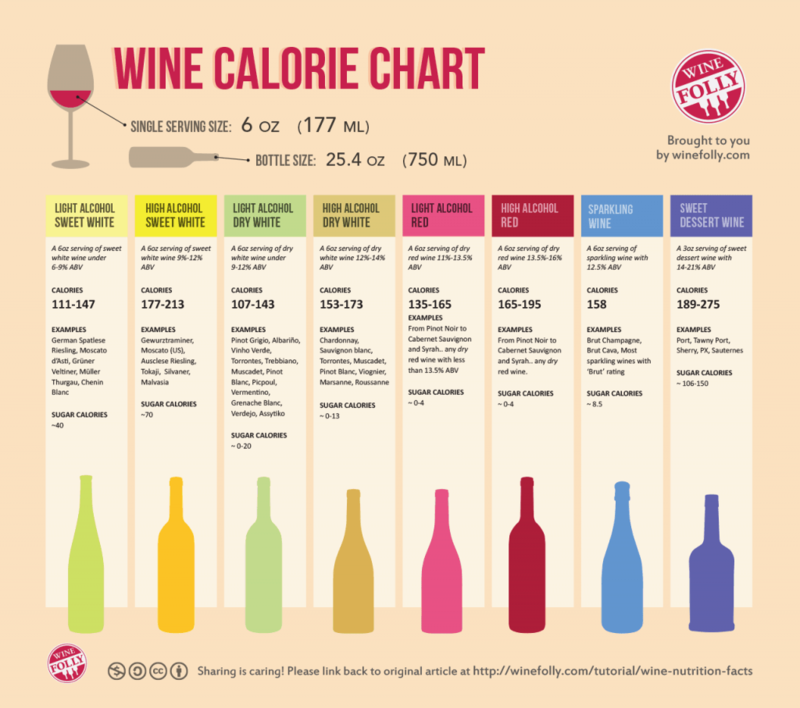 I found a handy chart below from Winefolly.com. You can see in it that some of the best options are reds like Pinot Noir, Cabernet Sauvignon and Syrah. In comparison, some of the worst options are Moscato, Riesling, Champagne, Port, and Sherry t name a few. Wine comes loaded with antioxidants and polyphenols, particularly Resveratrol. Resveratrol is being found to be the main contributor to many of the benefits of drinking wine. This polyphenol is found much more in red wines because it’s found in high concentration in grape skins. Remember, drink in moderation. Just because wine has been shown to increase life expectancy, that doesn’t mean 2 bottles a day will help you live to 200. What about white zinfandel wine? Being a fermented drink, wine is also a source of probiotics. That’s one of the ‘secrets’ of its potential health benefits. For example, they compared wine and grape extract (same varieties) in a study and wine had more beneficial effects. Never even thought about that! Do you know which probiotic strains are found in wine? I wonder if there is a difference between red and white wine’s probiotic amounts. Sorry for the delay. Lactobacillus strains dominate, but there are also some wine-specific strains, too. Red wine is mentioned more often so it might be more beneficial. However, the wine-making process must include probiotics and white wine definitely contains some.